I have been so anxious for spring to get here this year! I have so many plans for my yard, front and back, that I can hardly wait to put them into action! After missing out on any gardening activity last year, I am raring to go and find myself impatient to begin. It will be interesting to see how it all turns out! I bought a small notebook at the dollar store and labelled it "My Gardening Dreams". 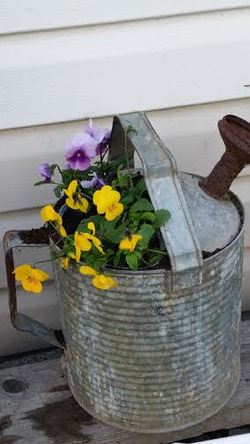 In it I have written out my ideas for container gardening. I listed everything I have that I can turn into a garden, and next to it I listed the things I would like to have to turn into a gardening container. There is a list of seeds I want and a list of things that I grow from seedlings that I need to buy. I also have a list of herbs I want to grow this year as well. Everything I grow this year needs to be as portable as possible since we are renting. We live in a townhouse complex and that means that our backyard space is fairly limited. We do have a bit more space than a lot of townhouse complexes and for that I am grateful. I need my yard space to be able to accommodate several things. 1) It needs to be able to hold all my containers for gardening in an pleasing manner. All containers must be easily reached for watering and maintenance. 2) There needs to be room for a swing set and a play area for the grandbabies who live with us as well as come to visit. 3) There needs to be room for our medium sized dog to enjoy the outdoors. 4) I need a clothesline. I love to hang my clothes out to dry and want the space to do so! My sister (I love my sister!) gave me her umbrella clothesline when she moved and I just need to buy the part that goes into the ground to hold it. One of my daughters uses a patio umbrella holder that you fill with water and she piles several very large rocks on top of it to hold it in place. It works for her! I found an in ground device that doesn't need to be cemented in so, that's a win for me!!! 5) I want a space to ENJOY my yard. In addition to our backyard, we have a bit of garden space at the front of our home, and I have been working on that already!!! The first thing that I planted when we moved in here two years ago, was a rhubarb plant. My family loves rhubarb! The kids have always loved to pick a stalk and dip it in sugar to munch on. Unfortunately, I didn't think things through very well and I planted it in the front yard which gets next to no sun at all!!! So, now, I need to transplant it to the backyard where we have sun ALL day with little to no shade. Yes, I have a container for that! :) After looking at it today, I am going to need three containers, or a bigger one than I had planned on using. Also, my rhubarb has already gone to seed!!!! That took me by surprise! There were only a couple of thin stalks a few days ago, and I was excited to be able to pick my first crop of rhubarb! Oh, well! As my landscaper son says- there will be lots more rhubarb for next year!!! I am hoping to replace the rhubarb with shasta daisies. There is a clump of daisies sharing the small space already and I am hoping to spread them out to fill in that whole little garden area. The longer flower garden needed to be cleaned out, so I did that last year. I have a small collection of vintage watering cans and I got several cement cinder blocks ( yes- from my sister!) and one of our neighbors gave me a board that he wasn't using to place along the tops of the cinder blocks that I put along the back of the garden. I put my watering cans on that, and I moved a couple of small statues there as well. In front of the shelf of bricks and board, I put out my much loved garden ornaments, again, compliments of my sister! That was all that I accomplished last year! 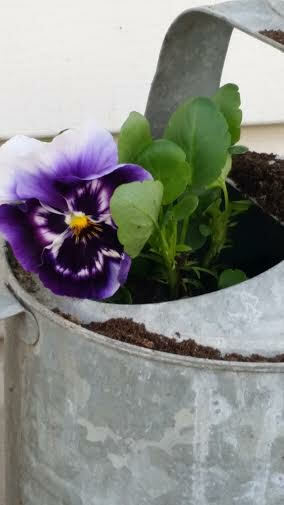 This year, I planted pansies in the watering cans and transplanted a small hen and chicks from a succulent container garden that a dear friend gave me last year( no-not my sister) into what used to be a water fountain! (I love succulents...and that is something for another post....) I think that it turned out pretty good! Today, (March 30) I planted four hosta plants in between my ornaments! I have never planted them before. I was kind of sceptical when I opened the package and saw a tiny bunch of dried up, stringy things...I have no idea what I expected to find, but it wasn't that! Anyways, I planted them. My neighbour says that in about two weeks I should see little green shoots sprouting through the dirt, and she showed me her hostas (which are beautiful!!!) that have pushed their way through the wet soil! I got excited all over again! Now I can't wait for mine to show up! There are a few tiny daffodils that came up in this front garden this year. I have never seen such tiny ones! They are lovely! There was also one lonely, large daffodil out there as well. I may just transplant her over to the daisy bed and plant her some friends this fall. And there are two tall, skinny tulips that just may find their way over to the daisy bed as well. I would love to plant some snowdrops along the front edge of the garden amongst the tiny daffodils. Anyway, so far that is all that I have done for the front yard. I have lots of ideas for that space as well, so stay tuned to see what I come up with! I am interested to see what I come with, too!